Chaninja has been my favourite Theme/ Visual Style but the problem with it is that the author updates it but leave out other packages. There is yet to be a full package that contains everything. I take no credit in the author’s work, I merely compiled all the downloads into one and am offering it out for download. Some are taken from older version of his release but to me, it looks better. If you want to do it the hard way, try going to http://www.deviantart.com and search for all his little packages then install them and upgrading them. If you do not want to do that as it’s a waste of time, read on. Click on the following for a huge image @ 1024 x 768. The loading Ninja star instead of the boring “e” logo. File 2 – 5 is around 1.2mb while file 1/5 is around 138kb. You will need Winzip in order to joing the files back into one single ZIP file. Download all the files, place them in one single folder and run file 1/5. CHANINJA has been my favourite Theme/ Visual Style but the problem with it is that the author updates it but leave out other packages. There is yet to be a fll package that contains everything. I take no credit in the author’s work, I merely compiled all the downloads into one and am offering it out for download. Some are taken from older version of his release but to me, it looks better. If you want to do it the hard way, try going to http://www.deviantart.com and search for all his little packages then install them and upgrading them. If you do not want to do that as it’s a waste of time, read on. http://www.etegration.com is by no way has any relationship with this great author. All work are copyright of him (Chaminda). I can be contact @ weee@etegration.com if you feel I should not be doing this compilation which I feel is much needed. Hi, my real name is Chaminda Nissanka and I’m a student at UCT in South Africa (www.uct.co.za), this theme (my first) began as, and still is my hobby. My main difficulty is that I do not have an internet connection at home and I have to pay for access at local internet cafes with my pocket money. If you like this theme and can spare some credit, I would greatly appreciate it if you could donate some money (any amount) to me via my PayPal account (http://www.paypal.com). To donate money you need to create your own PayPal account (free) and send to my email address chaninja@yahoo.co.uk . The Paypal site is secure and very easy to use. I plan to use your donations to get myself connected. Then I can start my own webpage where I’ll continuously post my work. Maybe then I can answer ALL your emails, join the rest of the online chat community (ICQ etc.) and you won’t have to wait so long between updates. I’m gonna continue developing this theme and new themes in the future anyway, but if you can, I could really use some help. 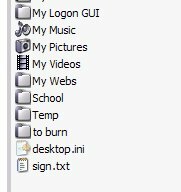 3) Unzip “ChaNinja.theme” file and the entire “ChaNinja” folder to your %Windir%\Resources\Themes folder. “echo %Windir%\Resources\Themes” to get folder name. 5) Select ‘ChaNinja’ from the Themes tab in Display Properties. This folder contains a picture you can use as your photo. Click on Start > Then on your username. The User Accounts windows will open. Click on Browse for more pictures and choose this picture in this folder. The .reg files in this folder basically only spped up the waiting time when you hover over your start menu. 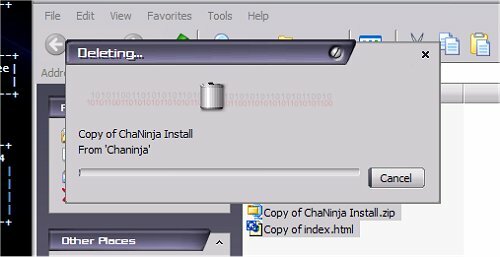 2) Right-Click on “ChaNinja.inf” file and click “Install” from context menu. 3) Goto Control Panel and select “Mouse” (accessible via “Printers and Other Hardware” if in Category View). 4) Click on “Pointers” tab and select the “ChaNinja” Scheme. 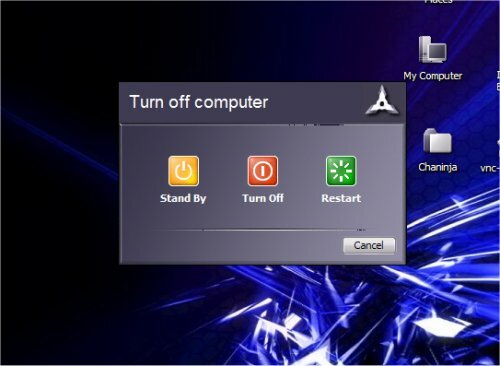 6) You may have to Log out and in again to see new icons. All the Installation / Restoration steps and Troubleshooting instructions are the same as the Shell32.dll for the MSGINA.DLL patch, except use the “Msgina.dll_Patch.exe” & “Msgina.dll_Restore.exe” from %Windir%\Resources\Themes\ChaNinja\Msgina Patch\ instead. 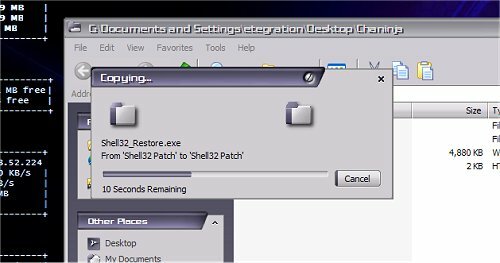 The Shell32_Patch will change your system shell32.dll so that the Copy / Move / Recycle Bin animations, IE throbber and “Please wait” screen so that it will match the “ChaNinja” theme. It is safe and reversible. 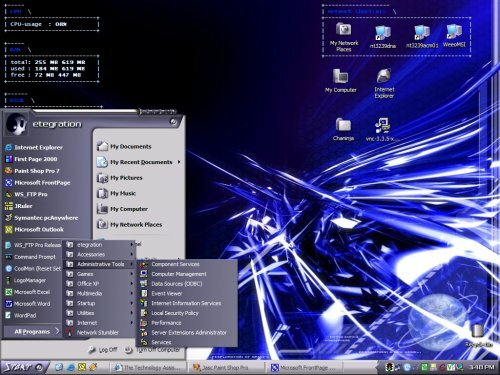 1) Copy “Shell32_Patch.exe” from %Windir%\Resources\Themes\ChaNinja\Shell32 Patch\ folder to %windir%system32\ folder. A) Make sure the Windows XP Installation CD is NOT in your CD-ROM drive. E) Repeat steps (1) to (5) above to apply the patch. 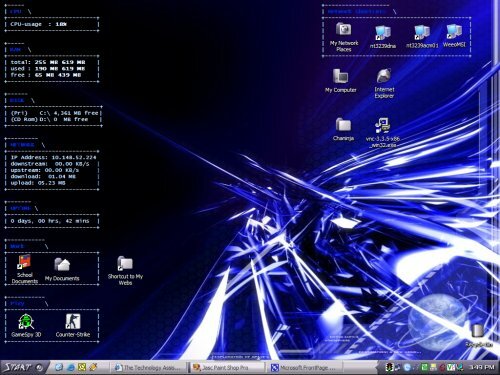 Once its complete copy the shell32.dll from your Desktop to the %Windir%\System32\ folder. You should then get the 2 “File Protection” messages. 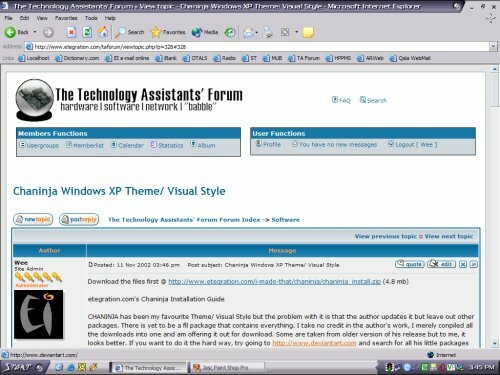 http://www.itcow.com/filemgmt/viewcat.php?cid=4 – Download my compiled Chaninja Theme.